Atmel/Microchip SAM L21 microcontroller module with USB UART. Sammy-L21 V1.0 is a versatile and very compact/small (just 18x38mm size!) 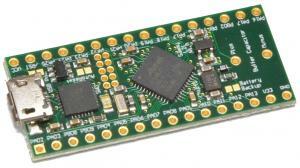 microcontroller board with the SAML21G18B microcontroller and CP2102 USB UART converter. All relevant controller signals are available on pin headers. 16MHz XTAL and 32768Hz TOSC watch crystal are included. The ultra-low-power ATSAML21 based Flash microcontroller (MCU) feature sophisticated power management technologies and consumes under 35μA/MHz in active mode and 200nA in Sleep mode. In addition to ultra-low-power performance, these devices feature Full Speed USB host and device, Event System and Sleepwalking, 12-bit analog, AES, capacitive touch sensing, built in opAmps and much more. The microcontroller module is shipped without preassembled pin headers, since everybody has different preferences or requirements. A Connector Kit with a suitable set of pin headers and receptacles can be ordered optionally. New: The Sammy-L21 can be ordered with preloaded chip45bootSAM Bootloader. With the free chip45bootSAM Windows GUI the application (hex file) can be uploaded through USB. No additional programming tool is necessary. USB 2.0 Cable A micro-B-5pin, 1.0m.